Hot and Sour Beans. Normally, I would cook them so that there was a little liquid/sauce left. But that's what I get for making fun of mom's cooking, isn't it? Hot & Sour Beans is my ultimate in comfort food. When I get sick, or am cranky, grouchy, or otherwise need a solid round of comfort food, this is what I crave. Mom used to make it all the time for us, when we were growing up (the high amine version, of course). Now, I love my mom. But she was never aces in the kitchen. Simple foods were great, but anything more just wasn’t her style. So Hot and Sour Beans was a staple. Easy to make, delicious, and filling. I’ll show you the original recipe, before I move on to the low-amine hot and sour beans recipe made with homemade baked beans. Cook ground beef in a pan till mostly done, breaking it up into small bits. Drain fat. Add beans, vinegar, and cayenne to a pot. Heat on medium and reduce to a simmer. Simmer on low for 20 minutes, stirring occasionally. Add cayenne or vinegar as needed. Serve piping hot over rice. 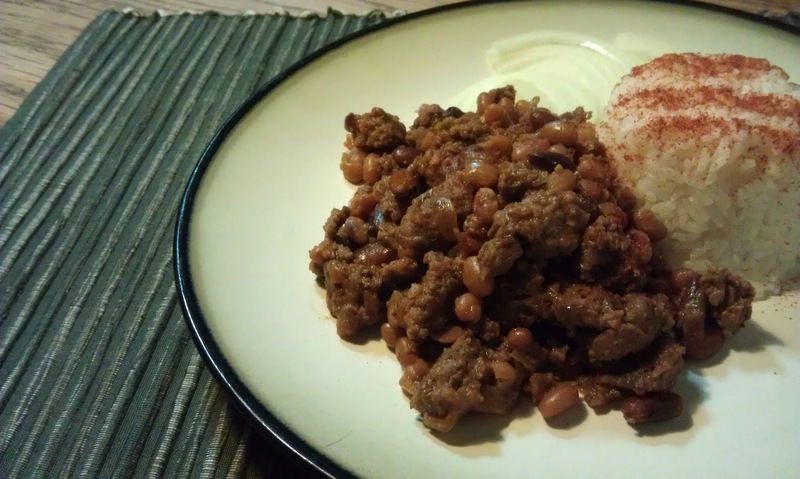 To make it a low amine food, I swapped out baked beans in a can for homemade baked beans and exchanged vinegar with ascorbic acid. The rest is delicious history. In a large pan, cook ground beef over medium high till mostly done, breaking it up into small bits. Drain and discard fat. Add beans, ascorbic acid, water, and cayenne. Once hot, reduce to a medium-low simmer. Simmer, covered, for 20 minutes, stirring occasionally. Add cayenne or ascorbic acid as needed to tweak flavor. Serve piping hot over rice and enjoy my low-amine version of Mom’s awesome, easy, ghettofabulous Hot and Sour Beans!